April saw the start of the season for our Junior teams. 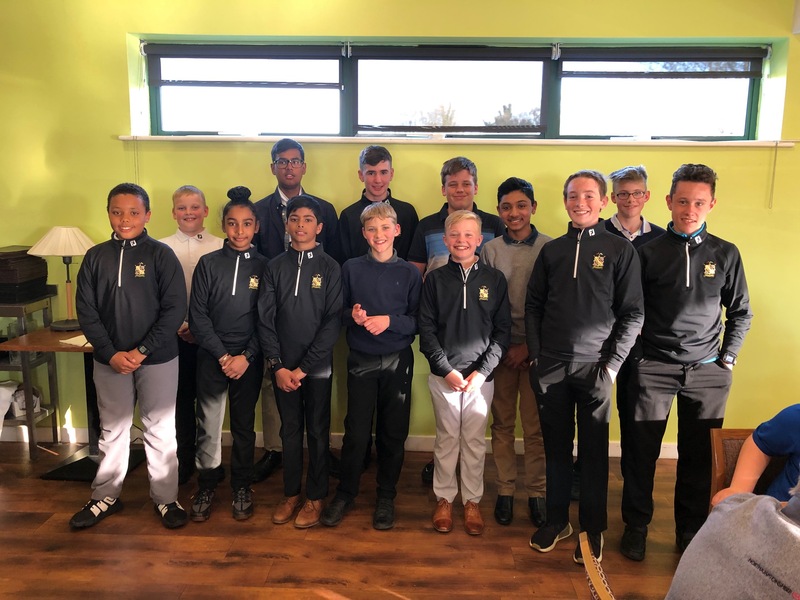 We opened with an U14 Friendly v Cambridgeshire at Ely City GC on Sunday 7th April. This is a new fixture in the U14 calendar. The weather was quite unkind to us as it rained for most of the afternoon and the temperature didn't get above "ridiculously cold!". As usual the lads seemed not to notice the weather and just got on with the golf. The teams of 12 played a format that we hadn't seen before - 9 holes of greensomes matchplay followed by 9 holes of singles matchplay (played in a fourball). The younger players played from the red tees whilst the older lads played from the white tees. It was an interesting experience for our players who came a very close second on the day. The following day (Monday 8th April) we hosted Essex at Bedford & County GC for our regular U16 Friendly. As usual, Essex brought a very strong team of 12 single figure handicap golfers. This year we played the matches on a handicap basis which made the fixture more competitive. Bedfordshire were narrow winners on the day having played on a very well presented course. There were a few debutants in the Bedfordshire U16 Team, namely: Samuel Buck, Tom Kirk, Harry Lake, Connor Tallentire and Dillon Basi, Harry, Connor and Dillon are all still U14 players so this was a test for them which they all passed with flying colours. On Wednesday 10th April we hosted an U14 Friendly match against Northamptonshire at Aspley Guise & Woburn Sands GC. 7 pairs from each side played fourball better ball matches with Northamptonshire just taking the victory. There were nonetheless some splendid performances from our players. The team from this match is pictured below. From Left to Righ: Kai Williams. Nathan Church, Vikram Singh, Jagjeet Kumar, Dillon Basi, Owyn Pepper-Thompson, Henry Wooster, Harley Allen, Harry Lake (Captain), Shaun Thomas, Edward Tubridy, George Wooster & Robbie Simpson. Connor Tallentire had to leave early for his holiday! Having watched these players (and others) on the Junior Tour and over the two friendlies this week, I know that this is a group of fine young men (as are our U16s and U18s) and I feel that we have a lot of potential in our hands at this level. I'm looking forward to seeing them develop into a strong team that will go on to win in the future. Next week our U18 Team will be defending the BUT Trophy at Yarmouth & Caister GC.